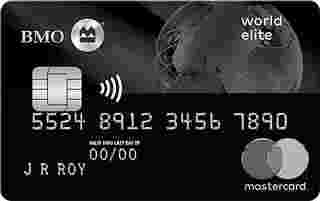 BMO World Elite MasterCard is typically available to those with excellent credit scores (650 or greater). Although it’s not the best travel credit card in Canada, it’s not bad. The LoungeKey access and included travel insurance are easily worth more than the annual fee so you’re getting a lot of value here. If you love to travel in style and you’re looking for a credit card that can both feed your travel bug and help you get closer to your next jet-setting trip, the BMO World Elite MasterCard is a great place to start. If you’re a fan of Air Miles and are looking for a credit card that will allow you to earn as many miles as possible — this card should be your go-to. However, if you’re interested in travel rewards cards in general, there are options out there that can help you pay for flights quicker. All things considered, this credit card is great for those looking to buy everyday items while earning travel rewards. So, when you swipe your card for your weekly or monthly groceries, you’re also saving up for that romantic getaway or family trip. If you are interested in getting a credit card that has a high earning on all purchases, not just in specific categories, then the BMO World Elite is one that is certainly worth considering. This is an elite level card (alongside Gold and Infinite level cards), and is a best in class among those types of cards. This card is a great option for those who reach for their plastic daily on everyday purchases like gas and groceries. Its earning structure is similar to a cash back card in that rewards are earned on every transaction, and not limited to specific retailers or eligible purchase types.